Believe it or not, trouble free cooking is a common desire around the world. Even those among us who love cooking and eating almost equally will be the first to confess that being able to cook without the worry of creating a mess, spilling, or burning would be a blessing. 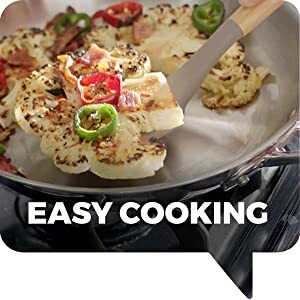 Truthfully speaking there really is no such thing as trouble free cooking though there are things you can do that will take a good deal of trouble out of your cooking. Most of the tips here will be beneficial to novice or beginners in the culinary arts however, there are some great refresher tips for those who are more experienced when it comes to cooking as well. Hopefully you will learn some things through the next few paragraphs or at least remember some things you had forgotten. First of all, cleaning as you go will take a lot of the trouble out of what comes after the cooking. When asked the least favorite thing about cooking a wide margin of women proclaim without a second of hesitation that the clean up by far is the worst thing about cooking. To make things easier, clean as you go. Keep a sink of hot sudsy water ready to go the entire time you are cooking and wipe up any spills that occur immediately to avoid sticky messes that are much more difficult to clean afterwards. You should also note that if you transfer your food to serving dishes and immediately wash your pots and pans they will be much easier to clean than if the food is allowed to sit in them while your family dines. My best friend is constantly burning her dinners. The reason? She believes in high or low when it comes to cooking and there is nothing in between. Very few meals should be cooked on high truth be told. You are much better off to begin the food preparation at a medium or medium high temperature and to adjust accordingly. Make sure your oven is preheated. The temperature of the oven does indeed make a difference in the cooking process. While there are those that believe preheating is a simple waste of electricity it is what is required in order to achieve the optimal results when cooking. Most modern electric ovens will signal when the proper temperature has been achieved. Select recipes that fall within your comfort zone in order to avoid making mistakes or becoming too stressed about the cooking process. Once you've decided on your recipe read it through a couple of times in order to be certain that you not only understand all the steps involved but also have all the necessary ingredients before beginning. Wash your hands thoroughly and wash your hands often. Remember the sink of sudsy water I mentioned above? You'll want to use it quite frequently in order to wash any surface, cutting board, plate, or utensil that has come into contact with raw meat in order to avoid cross contamination. The same holds true for your hands. While to some degree these tips may seem a bit simplistic, when it comes to trouble free cooking there really is no such thing. The more you do to make the cooking process seem as effortless as possible the more trouble free your cooking will really be.